This band was formed fifteen years ago, also in Berlin, and besides some demos, there were three official releases: Impuls (Ashen Productions, 2009), Fieber (self-released the digital way, and physically available via Ashen Productions once more), and Storchenwahrheit,-wirklichkeit (also independent + on tape via Eternal Rabies Kult). 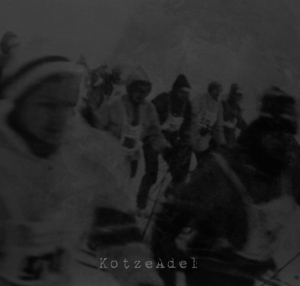 KotzeAdel too was digitally released by the band itself, and in its physical shape by Bleeding Heart Nihilist Productions, be it on compact disc, including a twelve-page booklet with sober yet bizarre artwork. And just FYI: the material has been released on tape too in meantime via Eternal Rabies Kult. Anyway, this material was recorded in a studio in the band’s home city in November 2015 (Hidden Planet Studio, with Earthship frontman Jan Oberg, who did some more mastering duties for bands like Vrångbild, Space Chaser, Barreleye, Deathrite, or his main project Earthship), and the seven elegies clock almost forty minutes. KotzeAdel is not an average release. It contains Black Metal, indeed it does, but not of the predictable kind. Okay, the bigger part stands for Orthodox Black Metal, mainly fast and energetic. It consists of the ‘usual’ ingredients, i.e. melodious riffing with, in a way, an epic touch, hammering drum patterns, melodic bass lines and harsh, little hysterical and shrieking screams. That’s, in a nutshell, the main content of the material on KotzeAdel. But Animo Aeger have more to offer. There are the many decelerations: (sometimes unexpected) changes towards slower, even doomy passages. Even within these slow excerpts, the heaviness and intensity remain as overwhelming and effective. Also vocal-wise, the band comes up with sudden surprises: spoken words, clean singing, wretched and disturbed chants, deep-growling grunts, and so on. The tracks are ‘sung’ in their mother tongue, Deutsch, jawohl, dealing with critical social matters, madness and man’s possible mental states of mind. The band makes use of some piano fragments too, created and performed in a ‘beautiful’ way, which adds a worthy value for sure. The great variation in performance shows the band’s joy, or is it lust, to innovate, but luckily it is not of the so-called ‘progressive’ kind, nor is it like some frenzy avant-gardist pseudo-realization. In contrast, everything sounds very natural and pure, for the exaggeration is not of the exaggerated kind (got it?). it shows a certain joy-of-play for sure, and this represents the band’s vision on our beloved world and its fantastic human population. FYI: in a near future, I will also write and publish a review on the newest release of Cruda Sorte, which is sort of a side-project of Animo Aeger.